Be wary of non authorized sellers on our listings. To ensure you will receive an authentic NNJXD product, please make sure the seller are purchasing from is "NNJXD". After selecting the size and color, there will be a caption below that will read "Sold by NNJXD and Fulfilled by Amazon." In order to be irreplaceable, one must always be different---NNJXD. Cotton Polyester Lace Blending. Size Table means age ranges for girl, but they are for general guidance only. For most accurate fit, we recommend checking detailed measurement before purchase. Both gently hand wash and dry-clean are recommended. Use mild detergent and hang dry, but do not bleach, and use hot water. The Europe Style Vintage Embroidered flower is decorated on top dress, more elegant design with Big Sequins Bow on the back make the dress looks more lightsome and romantic. Suitable for daily wear and special occasion like wedding party, holiday party, ceremony, baptism, birthday party, pageant etc. Worry about no beautiful than other little kids? Want to been commended and admired on the wedding party ? Tutu with the inside layer of the skirt is soft satin and densely tied tulle make the skirt fluffy. Unique Backless Design highlights the princess temperament, fresh and lovely, bring special beauty view. 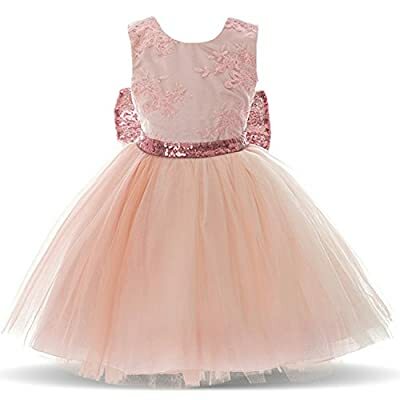 Our NNJXD princess dress can realize this dream for each girl, it'll be the best gift for your little girls.